Norwegian Cruise Line have announced plans stamp out smoking in cabins, following in the footsteps of other cruise lines, including Princess Cruises and Carnival Cruises, as reported in June. Norwegian Cruise Line's latest announcement is that smoking will no longer be permitted in cabins or in public areas inside the ships. Smoking on balconies is permitted, however cigar and pipe smoking on balconies is prohibited. Smoking will still be permitted in the casino, in designated smoking areas, and on deck, where signage permits smoking. Smoking on deck will not be tolerated near to venues serving food and open spaces, such as the jogging track, the sports complex, the children's pool and The Haven. Guests can, however, enjoy the enclosed cigar bars onboard Norwegian Epic, Norwegian Gem, Norwegian Pearl, Norwegian Dawn and Norwegian Spirit for cigarette, cigar and pipe smoking. 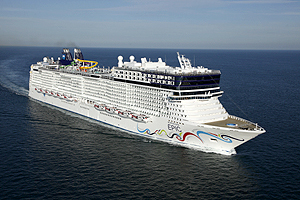 The changes have been bought in due to changing guest preferences, according to the cruise line, and will be effective as of January 2012 onboard all 11 of NCL's ships. More information about smoking onboard will be available in the Freestyle Daily, once onboard the ship.